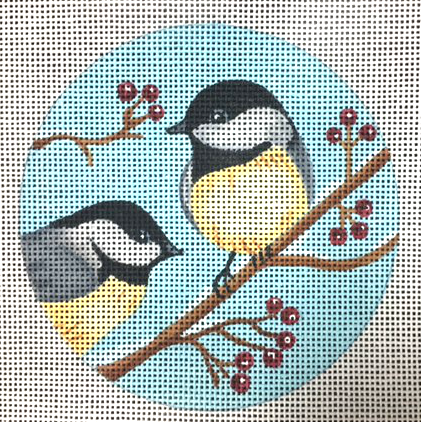 A needlepoint Christmas ornament by Nenah Stone of two chickadees in a tree with a pastel blue sky background. The design measures 4" in diameter and is hand painted on 18 mesh needlepoint canvas. If you wish to hold this canvas on stretcher bars while you stitch it we recommend two pair of 8" and some thumb tacks.